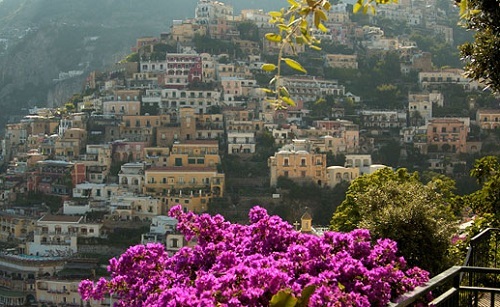 The province of Salerno is a combination of unique emotions. It is the beauty of the coast. It is the charm of an ancient history. 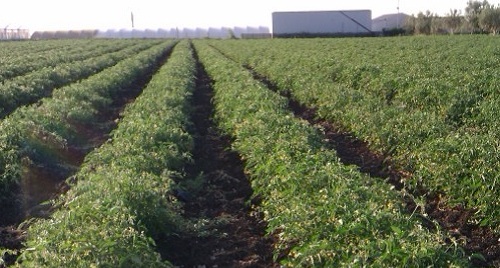 It is the scent of an unspoiled environment. For all these reasons, it seduces and conquers the visitor’s heart every time they enter its territory. It only takes a little to discover such magic. The Apennines, true monuments to nature, frame a dimension of soft sea breezes, small bays and coves, a pristine coast, streams surrounded by green forests, picturesque villages, places of a distant past, ancient traditions, of things still made with love. If the appeal of the coast captures the look of the world, the inland conquers the soul of those who explore it. The marvelous littoral, filled with beaches, cliffs and enchanting caves, facing a sea that is a kaleidoscope of colors, prepares the visitor to the splendor of the interior. Green valleys crossed by the Sarno River, with the Picentini and Lattari Mountains looking over, landscapes drawn by geometric cultivations from which the intense red of the San Marzano tomatoes often emerges. 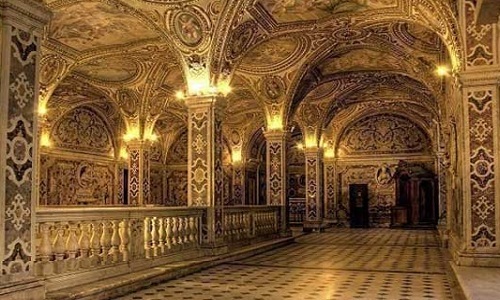 This is a welcoming land that offers its guest flavors and scents, quiet and silence while it tells its history through palaces, churches and castles, popular traditions and cultural events. A generous nature that has not left behind a single corner of the province. One can feel to have crossed the boundaries of Cilento. Sheer cliffs, caves and caverns, white beaches, maquis and a multi-coloured sea: such is the Cilento Coast, which stretches from Acropoli to Sapri crossing many picturesque villages filled with history. Driving inland, the visitor enters the heart of the National Park, a natural treasure where the green of the oak, maple, ash and chestnut forests becomes more intense and, on the mountains, give way to tall beech forests. It is a world of contrasts, tied to one another by the harmony of an environment of incomparable beauty. A trip to this land remains fixed in the memories of the heart, protected by a love that will take the visitor back to this land. A rough diamond transformed by man into a precious jewel, a work that has required time, labor and care, indispensable to reach such a perfect balance between natural beauty and that created by the creativity of man: this is the Costiera Amalfitana. It is the result of an effort that is evident to everybody. 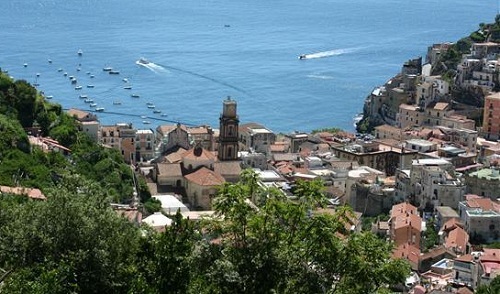 It can be felt when arriving at Vietri sul Mare, entrance portal to the Divine Costiera. The visitor is stunned by the bright and intense colours from every angle, by the light it releases from every corner as the sun had a special connection with them, by the shapes that the elements have given the cliffs, by the cobalt blue of the sea that blends with that of the sky, by the colourful houses hanging on to the rocks, by the signs of ancient civilizations, by the artwork exposed in this natural museum, by the joy of the local people, by the intense scent of the lemons and by the colour of the olive groves, the vineyards, and the blossoming gardens. This landscape can be found throughout the small villages lined up along the coast. 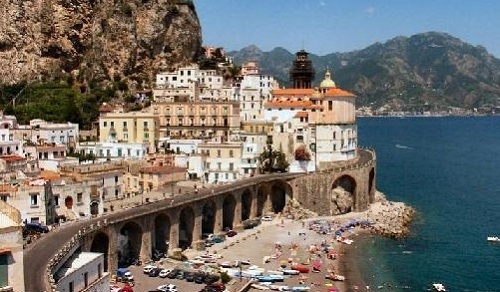 Amalfi, with its beautiful beachfront where streets, alleys and stairs meander through the town toward the Duomo, which is known for the magnificent mosaic façade. 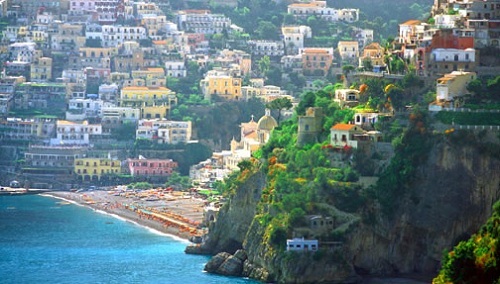 Atrani, a picturesque village where the bright colours of the gardens are interspersed among the white houses. The elegant and sophisticated Ravello, with the Duomo and the gorgeous Villa Cimbrone and Villa Rufolo, a mixture of different styles and periods surrounded by charming terraces and home of the famed Festival. Minori, famous for the beauty of the landscape and for the 1st century Roman villa, finely decorated with stuccos, mosaics and frescos. Praiano, which can be discovered by hiking the trails that wind through an unparalleled environment, or by visiting places such as the church of S. Luca Evangelista that displays marvellous 16th century paintings. 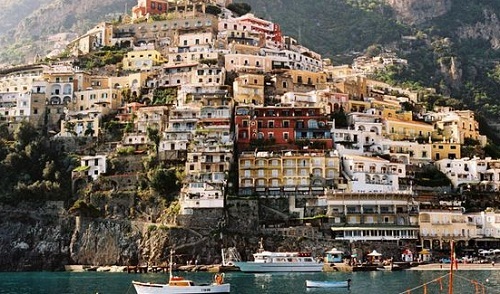 Positano, a gem nestled on sheer cliffs, with the three ‘Sirenuse’ islets just offshore. The colour of the houses mingles with that of the boutiques, the workshops and the elegant bars and restaurants that enliven the narrow streets. 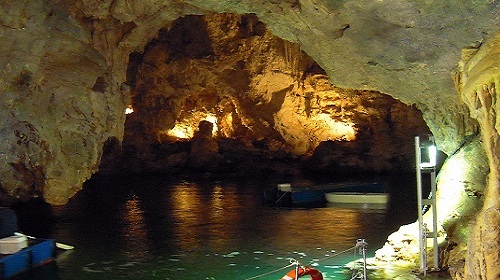 A visit to the Grotta dello Smeraldo, or Emerald Cave, is a wonderful experience thanks to the many stalactites and stalagmites and the bright colour diffused by the sunlight penetrating through the cracks of the rocks. In the Cilento area one can find a perfect holiday, as the beauty of the landscape is dotted with charming towns and significant archeological and historical sites. There are many itineraries along trails that narrate the millennia of history, with a gorgeous sea and pristine beaches framing it. 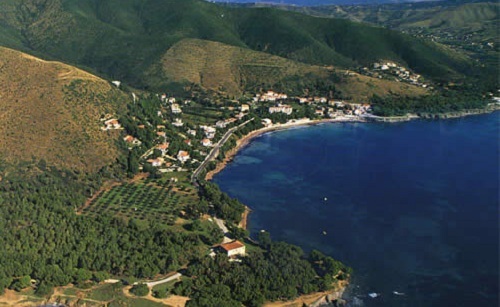 A small gem is the famous Marina di Camerota, with its peculiar port, the coves and the wonderful caves. 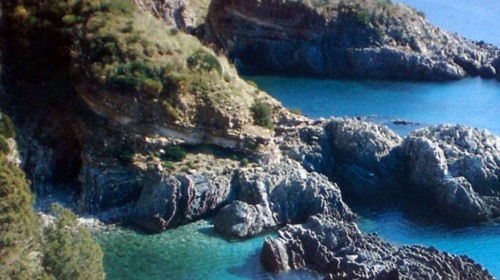 Also charming is the jagged coast of Palinuro, carved by the many sea caves such as the Grotta Azzurra. Crystal-water springs, lakes, streams and rivers set in a pristine environment characterize the interior of the National Park that protects the Grotte di Castelcivita and the Grotte dell’Angelo. 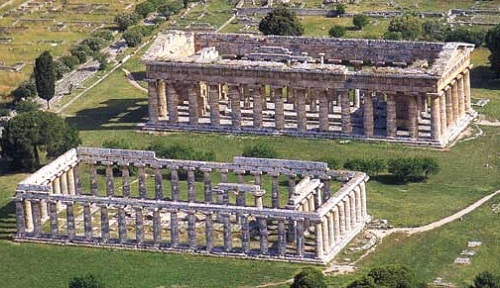 Paestum, known as the ‘plain of the gods’ thanks to best-preserved Greek temples, an invaluable heritage that UNESCO has titled World Heritage Site. Magnificent at night, and even more beautiful during the day when the three temples – the Temple of Hera, the oldest, the Temple of Neptune, the largest, and the Temple of Cerere, actually dedicated to Athena – acquire different shades according to the angle of the sun. Valued finds are exhibited in the Museo Archeologico Nazionale, among which the 33 metopes that once decorated the Temple of Hera and the frescos of the Tomb of the Diver from the 5th century BC. 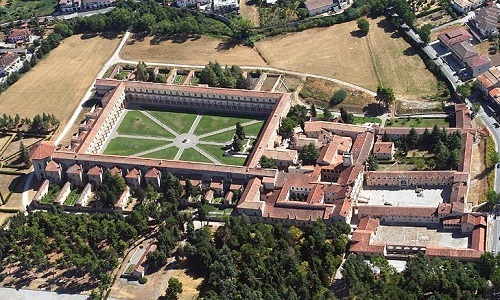 In the park one can find the majestic complex of the Certosa di S. Lorenzo, otherwise known as Certosa di Padula, one of the largest monasteries in the world. Salerno, the seat of this wonderful land, has a modern town built around the harbour and an old, medieval town at the bottom of the Arechi Castle from which there is a spectacular view of the whole Bay. Among the main attractions the city provides, the Duomo of S. Matteo, with the bronze portal and the tall cylindrical bell tower, and the Church of S. Giorgio by the precious furnishing and paintings. 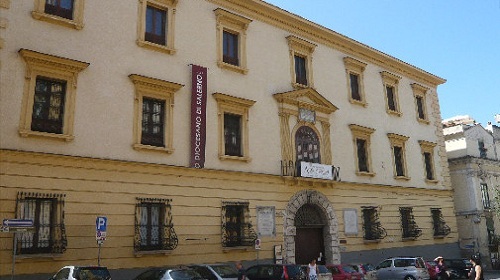 Finally, one should not miss a visit to the Museo Archeologico Provinciale, which displays items from pre-history to the late Roman Empire era, and the Museo Diocesano with its work of art and a valued numismatic collection. The area offers an open-air gym.The beauty of the sea is an irresistible call for those who love snorkelling, sea-watching and scuba diving. Windsurfing, kitesurfing, surfing, sailing, canoeing are also highly recommended. A boat trip searching for hidden coves or to visit the sea caves is an experience that will provide unforgettable moments. For those who want to just relax in the sun and dive into the crystal-clear waters, this land has plenty of beaches and coves blessed with the scent of the maquis and a fresh breeze cradling the visitor. The Spas of Contursi and Montesano sulla Marcellana offer treatments thanks to the healing properties of the mineral water. 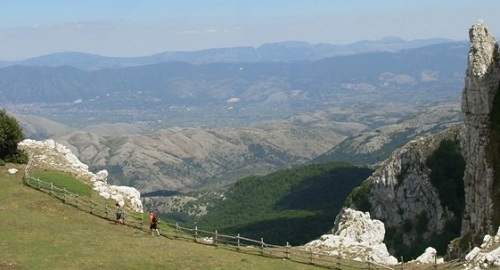 For the more intrepid tourist, the Cilento e Vallo di Diano National Park is the perfect place. 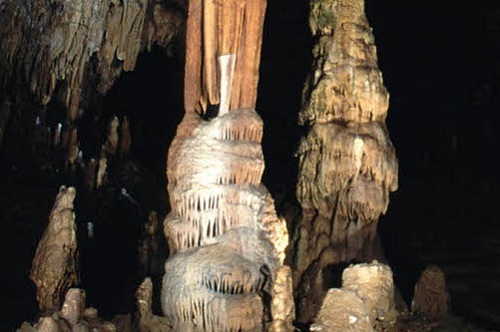 Recommended is the Grotte di Castelcivita trail, which winds through tunnels and underground passages filled with stalactites and stalagmites and arrive to the edge of the ‘death wells’, deep wells filled with water. 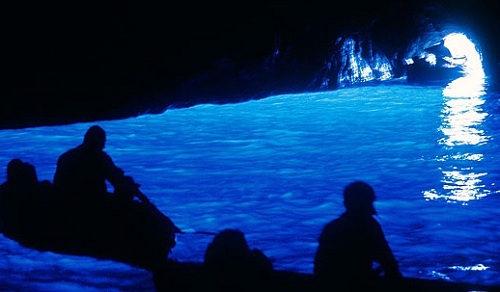 The itinerary of the Grotte dell’Angelo takes the visitor to the heart of the underground park, 2500 meters deep, in an almost surreal environment. 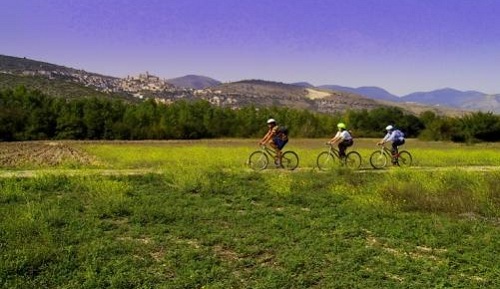 Trekking, hiking or mountain biking are a few ways to discover the beauty of this land. Cultural events and festivals spice up the villages and towns of the province. Of international fame is the Ravello Festival, originally established to commemorate the great composer Richard Wagner but evolved since to celebrate a broader concept of music and dance, albeit remaining tied to its roots. Ravello is called ‘city of music’ and, thanks to the new Oscar Niemayer Auditorium, the schedule of events will be busier than ever before. 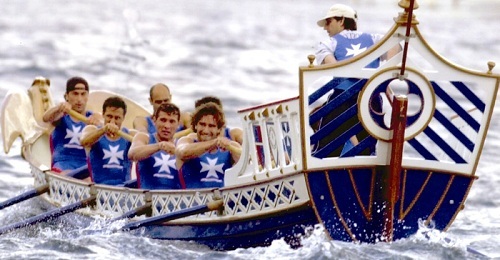 The Regata Storica is a re-enactment of the time of the Maritime Republics – Amalfi, Pisa, Genova and Venice – a rowing race that has been held for over fifty years alternatively in each city. The galleons, built reproducing the original vessels of the era, painted with the symbols of the Republics and conducted by a helmsman and eight rowers, challenge one another along a 2 km course. The International Dance Award has been held in Positano for over thirty years and is dedicated to the great choreographer Léonide Massine. 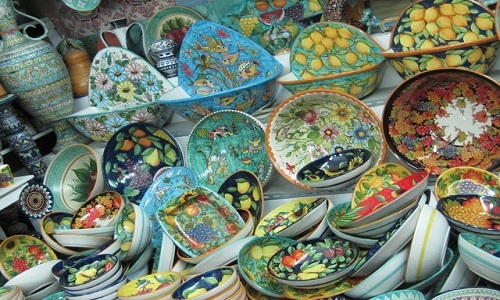 Those who love shopping and souvenirs will be able to choose from Moda Positano clothes to the prized Amalfi paper, from the colourful ceramics of Vietri sul Mare to the unique objects made with olive tree leaves of the Cilento region. Events in the area: Compelling is the Disfida dei Trombonieri held during the summer in Cava de’ Tirreni to remember the Battle of Sarno, where the eight Casali challenge one another with swords and knives to win the silver copy of the Pergamena Bianca, the White Parchment. Lastly, the area is known for its movida, with many bars and clubs open until the early hours. The delicious traditional food turns a great vacation into an extraordinary experience. The variety of products and recipes will not disappoint the expectations of those who seek flavours that evoke the passion and the joy of its people. There are many fish-based dishes to sample: for example, spaghetti with clam sauce, fish soup, fried anchovies, swordfish rolls, octopus cooked with S. Marzano tomatoes, and mussel ‘impepate’. As far as meat is concerned, the traditional way of cooking it is barbecued, accompanied by delicious vegetables. The cheese selection abounds with flavours and varieties. 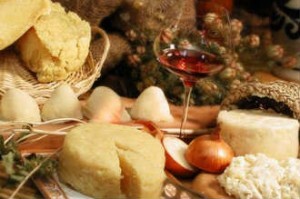 Provolone, pecorino, manteca del Cilento, scamorza, buffalo mozzarella and burrino are all still produced in a traditional way. There are also many recipes with pulses and vegetables such as the Controne bean soup (DOP), seasoned with few drops of the excellent Cilento extra-virgin olive oil, the S. Marzano tomatoes and the Amalfi lemons. 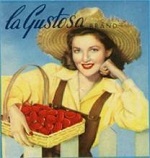 The tomatoes are the main ingredient for the pasta sauce, which has an even fuller flavour when handmade. 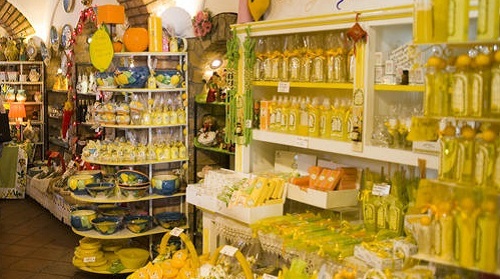 The Amalfi lemons are used to make the famous Limoncello and to prepare sweets and desserts such as the babà, whose dough is employed for the ‘torta babarese’ with whip cream and strawberries, the ‘sospiri’ and the lemon ‘delizie’. 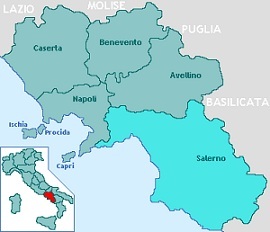 With regard to the wines, the Costa d’Amalfi, Cilento, Castel S. Lorenzo, Gragnano, Sorrento and Lettere, are all protected by the DOC denomination.